Although there has been some high heat in the southern Plains and most recently the southwest, for many areas of the lower 48 states, unless August turns around big time, it may be remembered as “a year without a summer.” After some early heat with 92°F in April, Central Park peaked at 86°F in May, just 84°F in June and so far in July 86°F. There really has been no heat wave so far in most of the major metropolitan areas, saving on air conditioning but with both chilly temperatures and frequent rains, cutting back on summer beach traffic and outdoor activity. Many experienced forecasters in the Great Lakes and northeast have noted similarities to the volcanic summer of 1992 (more on that next week). Yet this year, NOAA and the EPA (pdf) released reports suggesting heat wave frequency was increasing and would continue to do so this century. The reports were based on the IPCC findings but unencumbered by the facts, armed with supercharged models and emboldened by an alarmist administration, the authors made even more extreme even ridiculous claims. Widespread changes in extreme temperatures have been observed in the last 50 years. Globally, cold days, cold nights, and frost have become less frequent, while hot days, hot nights, and heat waves have become more frequent. Severe heat waves are projected to intensify in magnitude and duration over the portions of the U.S. where these events already occur, with potential increases in mortality and morbidity, especially among the elderly, young and frail. 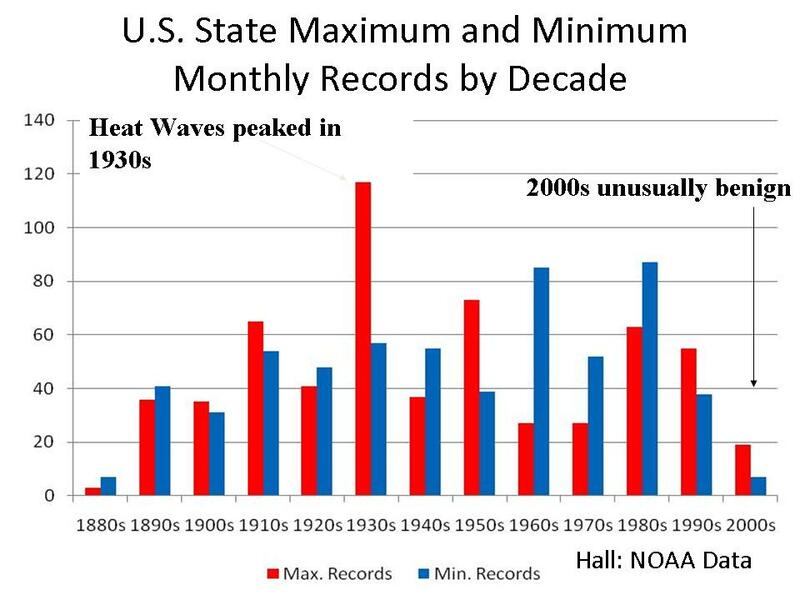 There is no indication that record heat is increasing in frequency, in fact the data shows a precipitous decline in the number of heat records in recent decades. The early 20th century dominates the heat statistics for the United States and the world. The presumption that global heat waves and extremes have increased in frequency is not supported by the official government data. 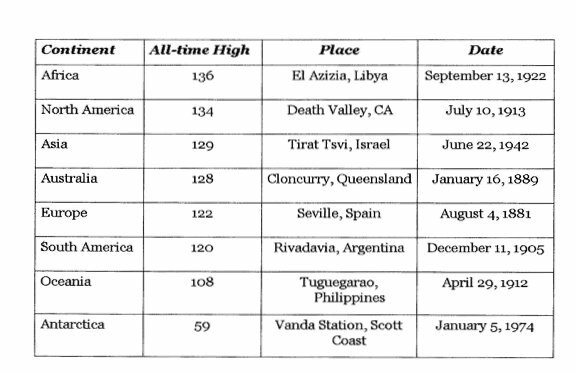 NOAA’s NCDC shows that record high temperature by continent have occurred mainly in the 1880s and early 1900s, with only 1 post 1950 (Antarctica in 1974) (See all continental records here). In the United States, there has been almost a total absence of new statewide records. There was no evidence of extreme warming based on temperature extremes (see records compiled by Bruce Hall here). See animation of statewide records by decade here. When examined on a state by state basis, the 1930s jumps out as the warmest decade with 24 state records. 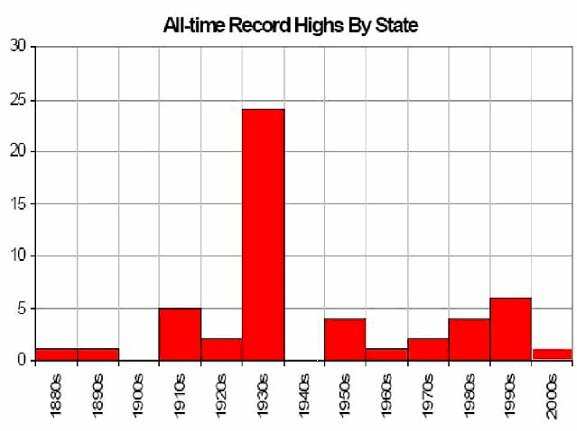 37 records occurred before the 1970s (see state records here). In Des Moines, Iowa, a continental climate far away from any large scale maritime influence, one would expect to see the effects of global warming extremes most. 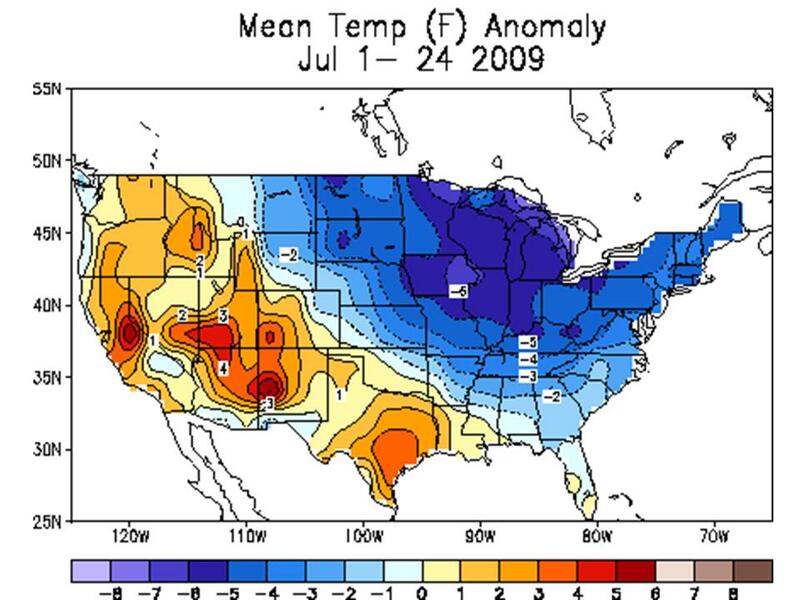 However that is not the case in the peak heat months of June and July. The last record highs in the months of June and July were in 1988. 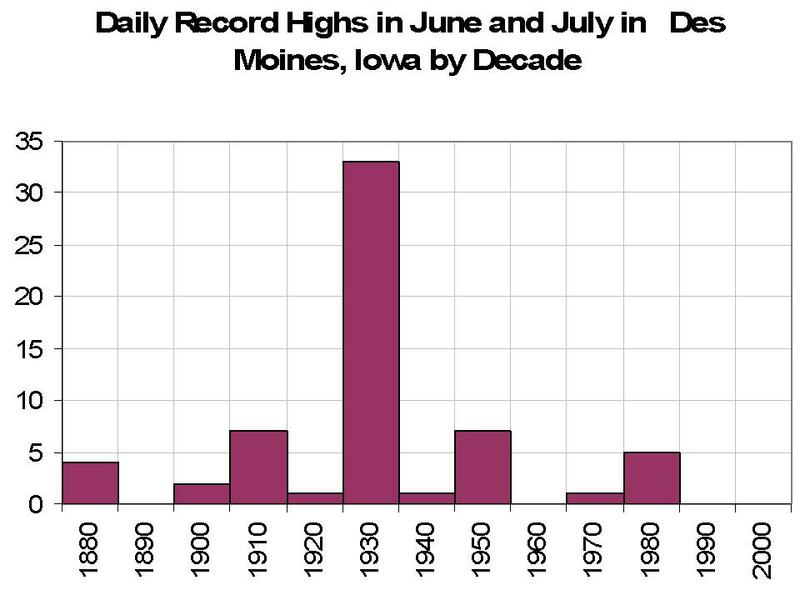 Here again, the 1930s dominate with 33 of the possible 61 record daily highs (see Des Moines records here). In Central Park, New York, where urbanization warmth is certainly an issue, the peak warmth again occurred early in the period with 100°F days peaking in the 1930s and 1950s and 90°F degree days the 1940s, a secondary maximum occurred in the 1990s but the number of extreme heat days with one summer to go has declined this decade (see New York Central Park records here). 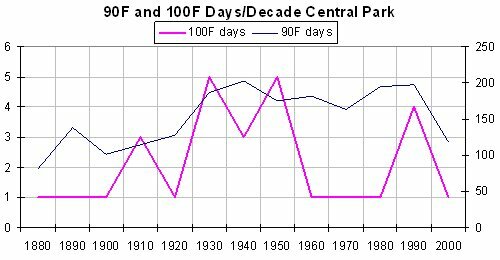 The heat was clearly most dominant in the middle of the 20th century with a “secondary” smaller max in recent decades. Here too, there is no evidence of an increasing trend. See word doc of this introduction here. See a more complete analysis including evidence the models are failing and that morbidity for cold is greater than heat and that overall morbidity for extremes had been declining for decades not increasing here. Read other takes on this issue by Mark Vogan here and Bruce Hall here. See Climate Depot’s very detailed compilation of cold and snow stories in the story: Climate Fear Promoters Explain Record Cold and Snow: ‘Global warming made it less cool’ - Switch from predictions of ‘climate crisis’ to “global warming made it less cool’ here. Joseph D’Aleo was the first Director of Meteorology at the cable TV Weather Channel. He has over 30 years experience in professional meteorology. Mr. D’Aleo was Chief Meteorologist at Weather Services International Corporation and Senior Editor of ÒDr. DewpointÓ for WSI’s popular Intellicast.com web site. He is a former college professor of Meteorology at Lyndon State College. He has authored and presented a number of papers as well as published a book focused on advanced applications enabled by new technologies and how research into ENSO and other atmospheric and oceanic phenomena has made skillful seasonal forecasts possible. Mr. D’Aleo has also authored many articles and made numerous presentations on the roles cycles in the sun and oceans have played in climate change. Mr. D’Aleo is a Certified Consultant Meteorologist and was elected a Fellow of the American Meteorological Society (AMS). He has served as a member and then chairman of the American Meteorological Society’ Committee on Weather Analysis and Forecasting, and has co-chaired national conferences for both the American Meteorological Society and the National Weather Association. Mr. D’Aleo was elected a Councilor for the AMS. Joseph D’Aleo is a graduate of the University of Wisconsin BS, MS and was in the doctoral program at NYU. Mr. D’Aleo’s areas of expertise include climatology, natural factors involved in climate change, weather and climate prediction, and North Atlantic Oscillation (NAO). Read other commentaries by Joseph D'Aleo.